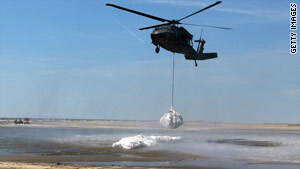 A Louisiana National Guard helicopter places sandbags Monday in Lafourche Parish to protect against oil. Washington (CNN) -- Congressional hearings into the massive oil spill growing in the Gulf of Mexico will start Tuesday, as winds continue to push the crude closer to the Mississippi Delta. BP America President Lamar McKay and Transocean President Steven Newman will appear before the Senate Energy and Natural Resources Committee in the morning and then the Senate Environment and Public Works Committee in the afternoon. BP leased from Transocean the oil rig that exploded off the Louisiana coast last month, starting the spill. Senators are expected to quiz McKay and Newman about the precautions taken before the blast that set off the underwater gusher and the steps being taken to stop the spill. Experts also are expected to testify on the possible impact of the spill on fishing, tourism and local economies. Also on Tuesday, Homeland Security Secretary Janet Napolitano plans to travel to Mobile, Alabama, "to inspect ongoing operations to minimize the Deepwater BP Oil Spill's impact on public health, the environment and the economy," the Deepwater Horizon Joint Information Center said in a statement. Napolitano and Alabama Gov. Bob Riley plan to talk with reporters late Tuesday afternoon, the center said. A change in the weather could push more oil from BP's Deepwater Horizon site into the Mississippi Delta region and areas west of the river, according to Gov. Bobby Jindal, who called the development "bad news for Louisiana." Video: BP keeping cap on oil leak video? Louisiana has been mostly spared since the oil rig exploded April 20 and sank two days later about 50 miles off the southeast coast of Louisiana. The catastrophe is sending 210,000 gallons of crude into the Gulf of Mexico each day. Most of the slick has been centered in an area east of the environmentally sensitive delta. "We've said all along that the oil coming west of the river would pose a whole new set of challenges," Jindal said at a Monday news conference. National Oceanic and Atmospheric Administration forecasters had warned over the weekend that the Mississippi Delta and areas to the northeast of it -- including Breton Sound, the Chandeleur Islands and the mainland behind them -- could see oil hit the coast by Tuesday.